Who’s ready for a fall-inspired adidas NMD and EQT ADV release? For those that are you’ll be happy to hear that there will be an exclusive release of both silhouettes going down this week. Champs Sports has just announced that they will be releasing an all-new adidas NMD and adidas EQT ADV Support dressed in Chalk and Olive color tones. 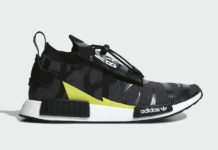 The adidas NMD sports a Chalk White upper with Olive accents, and 3M Reflective detailing on the Three Stripes and tongue. Going with an opposite look is the adidas EQT ADV Support that features an Olive upper atop a Chalk White rubber sole. Look for both the adidas NMD R1 and adidas EQT ADV “Chalk and Olive” colorways to release on August 3rd exclusively at Champs Sports. The retail price tag for both is set at $130 USD.